Imaging Demonstrated Proximity of Esophagus to Left Pulmonary Veins. The top left inset of the figure depicts the 3D reconstruction of the left atrium and pulmonary veins with the esophagus tagged in red. The course of the esophagus is along the posterior left atrium in contiguity to the left pulmonary vestibule. The ICE image of the left pulmonary vestibule shows the characteristic echocardiographic signature of an esophageal temperature probe in the 8 o’clock position. Mechanism of Esophageal Injury: Finite-element analysis supports that esophageal injury is exclusively due to thermal conduction from the atrium.BER05 Esophageal injury can occur despite small electrode size, low power (<30W), and low electrode temperature (34°C). There are two caveats however, irrigated electrodes and electrode-endocardial contact verification (direct visualization with ICE or force-sensing) may increase power delivery to the tissue. Avoiding Esophageal Injury: There has been much enthusiasm to determine means by which esophageal injury can be avoided. These include echocardiographic monitoring for microbubble formation,CUM05 the use of cryoablation to lower esophageal ulceration,RIP07 plan ablations to avoid esophagus by creating virtual esophageal tube using electroanatomic mapping,SHE07 esophageal irrigation to lower esophageal temperature,TSU07 and physically deflecting the esophagus away from the ablation site.HER06 The study by Muller et alMUL15 suggests the possibility that esophageal temperature probes may increase susceptibility to esophageal lesions. Figure 2 shows ICE images before and after orogastric tube removal. One notes the signature of the OGT at 8 o’clock in the left image. There is a small indentation in the posterior left atrial wall at the site of the OGT. On the right, imaging demonstrates this indentation is resolved after removal of the OGT. I make efforts to remove esophageal instrumentation to avoid any possible displacement of the esophagus towards the left atrium. Intracardiac Echocardiography (ICE) of Orogastric Tube (OGT). The left image depicts the ICE signature of the OGT at ~8 o’clock. There is a small indentation in the posterior left atrial wall at the site of the OGT. On the right, ICE demonstrates the resolution of this indentation after removal of the OGT. CF-sensing catheters have certainly enhanced ability to deliver more consistent lesions however, there are clearly limitations when the operator cannot see real-time electrode-endocardial contact. There have been many times where I have seen left and right atrial tenting due to catheter contact at less than 10g of force. Force sensing has certainly added to our armamentarium but I would caution all that there is more to ablation than contact force. Note: These radial ICE images would not be possible without my mentor, Dr. David Schwartzman (Pittsburgh, PA). GIL01 Gillinov AM, Pettersson G, Rice TW, “Esophageal injury during radiofrequency ablation for atrial fibrillation,” J Thor Card Surg, V. 122, No. 6 (December 2001), pp. 1239-1240. SCA04 Scanavacca MI, D’Avila A, Parga J, Sosa E, “Left Atrial-Esophageal Fistula Following Radiofrequency Catheter Ablation of Atrial Fibrillation,” J Cardiovasc Electrophysiol, V. 15, No. 8 (August 2004), pp. 960-962. PAP04 Pappone C, Oral H, Santinella V, Vicedomini G, Lang CC, Manguso F, Torracca L, Benussi S, Alfieri O, Hong R, Lau W, Hirata K, Shikuma N, Hall B, Morady F, “Atrio-Esophageal Fistula as a Complication of Percutaneous Transcatheter Ablation of Atrial Fibrillation,” Circulation, V. 109 (June 8, 2004), pp. 2724-2726. DOL03 Doll N, Borger MA, Fabricius A, Stephan S, Gummert J, Mohr FW, Hauss J, Kottkamp H, Hindricks G, “Esophageal perforation during left atrial radiofrequency ablation: Is the risk too high?” J Thor Cardiovasc Surg, V. 125, No. 4 (April 2003), pp. 836-842. CUM06 Cummings JE, Schweikert RA, Saliba WI, Burkhardt D, Kilikaslan F, Saad E, Natale A, “Brief Communication: Atrial-Esophageal Fistulas after Radiofrequency Ablation,” Ann Int Med, V. 144, No. 8 (18 April 2006), pp. 572-574. BUN05 Bunch TJ, Asirvatham SJ, Friedman PA, Monahan KH, Munger TM, Rea RF, Sinak LJ, Packer DL, “Outcomes After Cardiac Perforation During Radiofrequency Ablation of the Atrium,” J Cardiovasc Electrophysiol, V. 16, No. 11 (November 2005), pp. 1172-1179. SCH06 Schwartzman DS, Nosbisch J, and Housel Debra, “Echocardiographically guided left atrial ablation: Characterization of a new technique,” Heart Rhythm, V. 3, No. 8 (August 2006), pp. 930 –938. SAN05 Sanchez-Quintana D, Cabrera JA, Climent V, Farre J, de Mendonca MC, Ho SY, “Anatomic Relations Between the Esophagus and Left Atrium and Relevance for Ablation of Atrial Fibrillation,” Circulation, V. 112 (September 6, 2005), pp. 1400-1405. GOO05 Good E, Oral H, Lemola K, Han J, Tamirisa K, Igic P, Elmouchi D, Tschopp D, Reich S, Chugh A, Bogun F, Pelosi F Jr, Morady F, “Movement of the Esophagus During Left Atrial Catheter Ablation for Atrial Fibrillation,” JACC, V. 46, No. 11 (December 6, 2005), pp. 2107-21190. REN06 Ren J-F, Lin D, Marchlinski FE, Callans DJ, Patel V, “Esophageal imaging and strategies for avoiding injury during left atrial ablation for atrial fibrillation,” Heart Rhythm, V. 3, No. 10 (October 2006), pp. 1156-1161. MAL07 Malamis AP, Kirshenbaum KJ, and Nadimpalli S, “CT Radiographic Findings: Atrio-esophageal Fistula After Transcatheter Percutaneous Ablation of Atrial Fibrillation,” J Thorac Imaging, V. 22, No. 2 (May 2007), pp. 188-191. BER05 Berjano EJ and Hornero F, “What affects esophageal injury during radiofrequency ablation of the left atrium? An engineering study based on finite-element analysis,” Physiol Meas, V. 26 (2005), pp. 837-848. CUM05 Cummings JE, Schweikert RA, Saliba WI, Burkhardt JD, Brachmann J, Gunther J, Schibgilla V, Verma A, Dery MA, Drago JL, Kilicaslan F, Natale A, “Assessment of Temperature, Proximity, and Course of the Esophagus During Radiofrequency Ablation Within the Left Atrium,” Circulation, V. 112 (July 26, 2005), pp. 459-464. RIP07 Ripley KL, Gage AA, Olsen DB, Van Vleet JF, Lau C-P, Tse H-F, “Time Course of Esophageal Lesions After Catheter Ablation with Cryothermal and Radiofrequency Ablation: Implication for Atrio-Esophageal Fistula Formation After Catheter Ablation for Atrial Fibrillation,” J Cardiovasc Electrophysiol, V. 18, No. 6 (June 2006), pp. 642-646. SHE07 Sherzer AI, Feigenblum DY, Kulkarni S, Pina JW, Casey JL, Salka KA, Simons GR, “Continuous Nonfluoroscopic Localization of the Esophagus During Radiofrequency Catheter Ablation of Atrial Fibrillation,” J Cardiovasc Electrophysiol, V. 18, No. 2 (February 2007), pp. 157-160. TSU07 Tsuchiya T, Ashikaga K, Nakagawa S, Hayashida K, Kugimiya H, “Atrial Fibrillation Ablation with Esophageal Cooling with a Cooled Water-Irrigated Intraesophageal Balloon: A Pilot Study,” J Cardiovasc Electrophysiol, V. 18, No. 2 (February 2007), pp. 145-150. HER06 Herweg B, Johnson N, Postler G, Curtis AB, Barold SS, Ilercil A, “Mechanical Esophageal Deflection During Ablation of Atrial Fibrillation,” PACE, V. 29 (September 2006), pp. 957-961. MUL15 Müller P, Dietrich J-W, Halbfass P, Abouarab A, Fochler F, Szöllösi A, Nentwich K, Roos M, Krug J, Schade A, Mügge A, Deneke T, “Higher incidence of esophageal lesions after AF ablation related to the use of esophageal temperature probes,” Heart Rhythm, Published Online: April 03, 2015. Radial intracardiac echocardiography adds significant anatomic correlation during invasive EP studies. In particular, coronary sinus (CS) anatomy can be evaluated during CS access or ablation of the slow AV nodal pathway during AVNRT ablations. 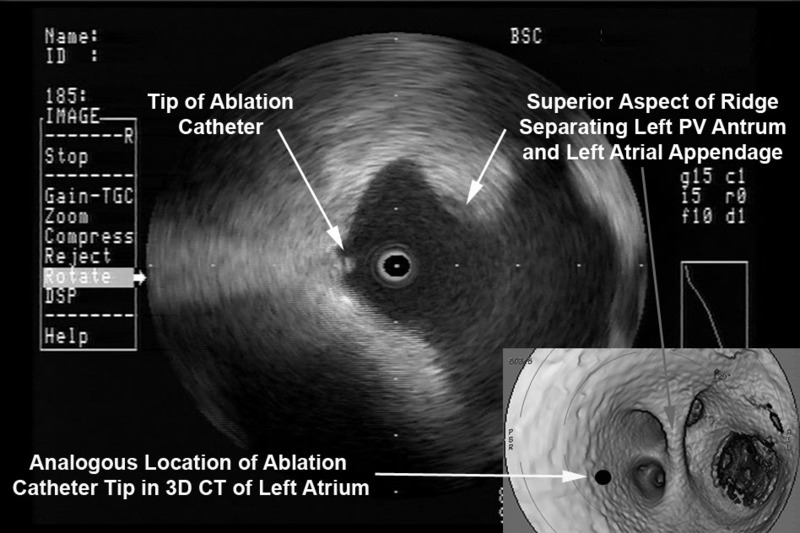 A steerable sheath (Agilis, St. Jude Medical) flushing with saline holds a 9MHz radial ICE catheter (UltraICE, Boston Scientific Corporation) and is positioned along the inferoseptal aspect of the tricuspid annulus. The left image shows the posterior aspect of the CS os and you can often visualize the right coronary artery (RCA) in this view. One can see a thickened roof of CS (or often a prominent Eustachian ridge). As the steerable sheath holding the ICE probe is advanced toward the right ventricle (RV), the main CS is brought into view as seen in the middle image. As you move more ventricular, the septal insertion of the tricuspid valve leaflet is brought into view. Finally, the right image depicts the radial ICE view when the anterior aspect of the CS os is brought into view as the probe is advanced even closer to the RV. This is where the traditional position of the slow AVN pathway is found – the slow AV node pathway is generally located at the anterior edge of the CS os near the septal insertion of the tricuspid leaflet. A nice anatomic study from Choure et al (“In Vivo Analysis of the Anatomical Relationship of Coronary Sinus to Mitral Annulus and Left Circumflex Coronary Artery Using Cardiac Multidetector Computed Tomography: Implications for Percutaneous Coronary Sinus Mitral Annuloplasty,” JACC, Vol. 48, No. 10, 2006) shows some detailed CT imaging of the relation between the coronary arteries and coronary sinus. The following image (taken from Choure et al) gives a nice visualization of the CS os and its relation to the RCA. One can see the circumflex crossing the mid-distal CS. 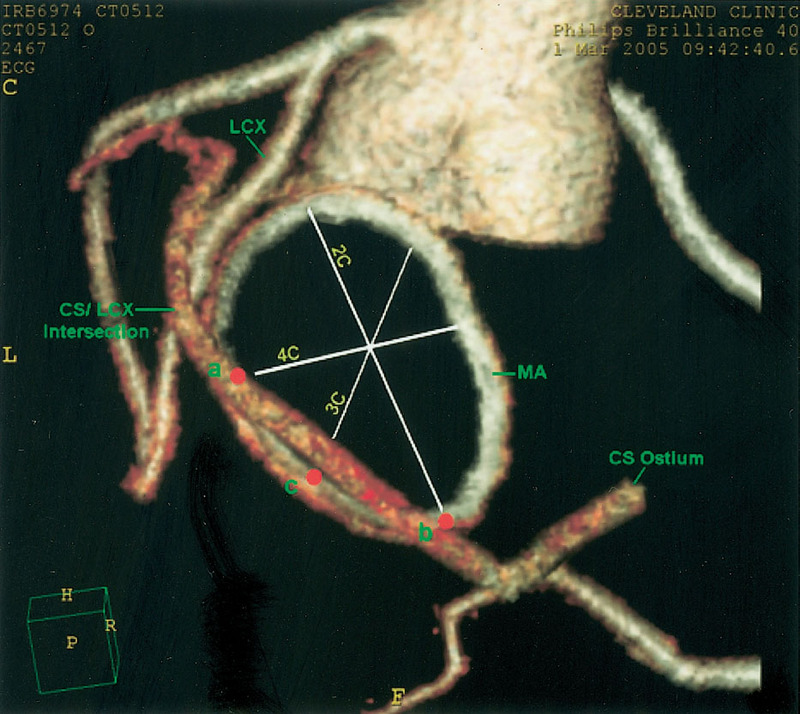 They found the circumflex artery crossed the CS at a variable distance from the CS os (ranging 37 to 123 mm). Intracardiac echo guided atrial fibrillation ablations: From transeptal puncture guidance to intra left atrial ICE guided ablation. Atrial fibrillation ablations can be accomplished using radial intracardiac echocardiographic (ICE) guidance and can help minimize fluoroscopic use. 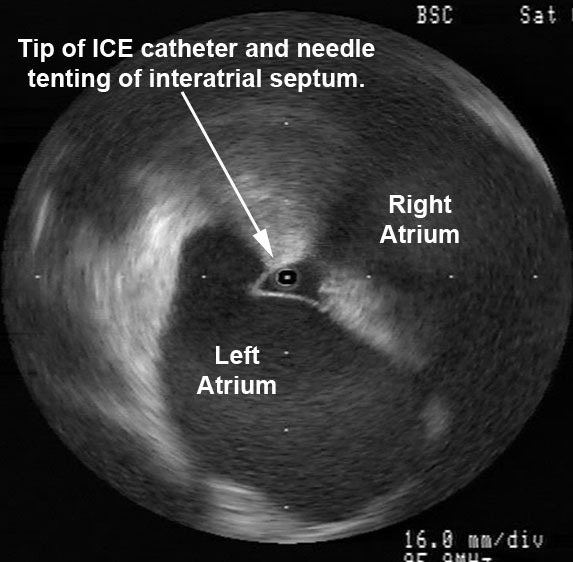 ICE imaging is initially used during left-sided ablations by facilitating transeptal punctures. Next, radial ICE can be placed in the left atrium to guide atrial fibrillation ablations and demonstrate stable ablation electrode-endocardial contact. Clearly, contact force-sensing ablation catheters have helped assess electrode-endocardial contact but radial ICE allows the operator to directly visualize contact. Furthermore, direct ICE visualization permits assessment of endocardial tissue deflection as well as anatomic guidance to help make left-sided ablations safer (e.g., location of esophagus, thickness of left atrial regions, etc). A full description of radial ICE-guided atrial fibrillation ablation has been previously described (1,2,3) but we will take a more detailed ICE tour of the ablative process. Transseptal Punctures can be safely performed using radial ICE guidance. A suitably sized Mullins introducer sheath (10-11 French) can be used to position the radial ICE catheter along the interatrial septum as shown in Figure 1. The Mullins sheath provides enough maneuverability to adjust the ICE catheter position in both inferior-superior and anterior-posterior directions to optimize the location of transseptal puncture in the fossa ovalis. Once ICE localization of transseptal needle showing tenting of the septum in suitable fossa is obtained LAO fluoroscopy is then used to guide the transseptal puncture and advancement of left atrial sheath. Figure 1 Radial ICE Guidance of Transeptal Puncture for Left Atrial Access. The left and right atria are well-visualized with the ICE catheter in the right atrium along the interatrial septum in the fossa ovalis. One can see the tenting evident when transseptal needle is in good contact with the interatrial septum. 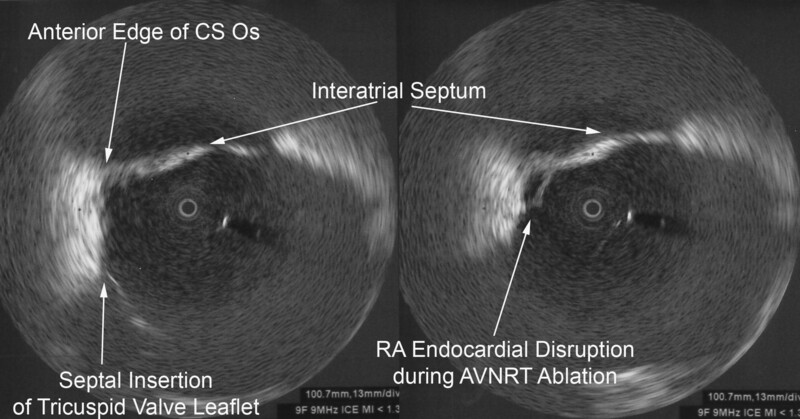 The following video shows the interatrial septum with radial ICE located in the right atrium. You see tenting of the septum and subsequent transeptal puncture facilitating left atrial ablation. Once transeptal access is achieved using an 8F Mullins sheath, a long wire exchange is performed to allow placement of the steerable sheath through which radial ICE is placed. An additional transeptal puncture is performed and wire exchange placement of 8.5Fr SRO sheath through which an irrigated tip ablation catheter is placed. Left Atrial Ablations can be enhanced and accomplished using intra left atrial radial ICE (with intraprocedural heparinization for target ACT>300). [1,2,3] Radial ICE is a useful adjunct imaging technique for several reasons. First, direct visualization of the electrode-endocardial interface allows precise positioning of the ablation electrode to guide lesion formation. Second, radial ICE permits the delivery of “focal” left atrial ablative lesions; the electrode kept in same location throughout energy application by manipulating the ablation electrode into firm, stable endocardial contact during continuous ICE imaging of the electrode–endocardial interface. Third, the use of continuous radial ICE during atrial fibrillation ablations allows close monitoring of catheter position and endocardial contact while minimizing dependence on fluoroscopy. Figure 2 depicts a typical view obtained when radial ICE is positioned in the left atrium using a steerable sheath (Agilis, St. Jude Medical, Inc., St. Paul, MN). Figure 2 Intra Left Atrial Radial ICE Imaging During Atrial Fibrillation Ablation Left Pulmonary Venous Antrum Isolation. The radial ICE catheter is positioned at the entrance to the left PV antrum with the tip of the ablation catheter (Thermocool irrigated tip, Biosense Webster Inc, Diamond Bar, CA) located at ~9 o’clock on the antrum. The inset shows the analogous location of ablation catheter on 3D CT reconstruction of the left PV antrum. Figure 3 Radial ICE Anatomy of Left and Right Pulmonary Vestibules. The right pulmonary vestibule is shown with the early portions of the upper and lower pulmonary veins. Superior to the right pulmonary veins one can see the main pulmonary artery and superior vena cava. The approximate location of Waterston’s groove is depicted by the solid line. 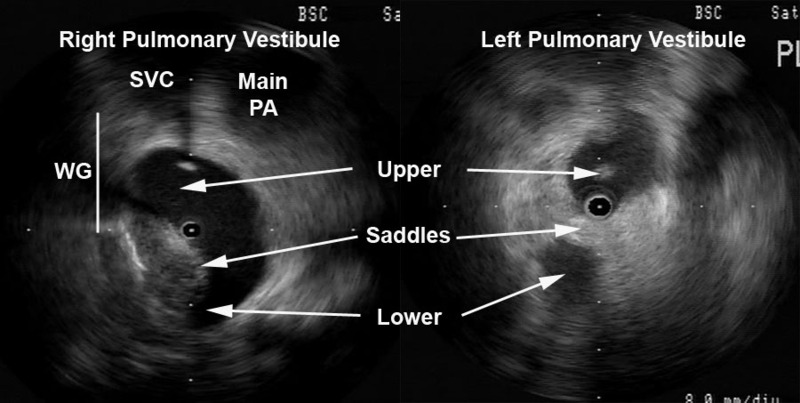 A more distal view of the left pulmonary vestibule (compared to Figure 2) clearly differentiates the upper and lower PV’s as well as the intervenous saddle. Once double transeptal access is obtained, the posterior left atrium pulmonary antrum isolation is started. I generally create a Fast Anatomic Mapping (FAM and CARTO, Biosense Webster, Inc., Diamond Bar, CA) shell of the left atrium trying to capture the anatomy of the left and right pulmonary veins to accurately recreate similar anatomy from the preoperative CT scan. This FAM shell is a complement to the real-time radial ICE that actually guides my ablation catheter placement. The left pulmonary vestibule is first encircled by placing a series of focal lesions applied contigously. Ablation is performed during sinus rhythm. High-frequency ventilation is used to minimize posterior LA motion. Each encircling lesion is composed of a series of contiguously applied (defined by direct contact of adjacent CARTO icons) “focal” (e.g., electrode kept in same location throughout energy application) lesions. For each focal lesion, the ablation electrode is manipulated under ICE guidance into firm, stable endocardial contact. RF energy was delivered during continuous ICE imaging of the electrode–endocardial interface. The following video shows catheter position while ablating the posterior aspect of the left pulmonary vestibule. Note the appearance of “bubbles;” this is saline irrigation during ablation. The 3D reconstructions CT scan below the video shows the approximate site of ablation catheter and the overall goal ablative lesion set pathway for the primary encircling of the left pulmonary vestibule. After deployment of this primary line of encircling lesion, I document that the myocardium subtended by the lesion is electrically isolated using entrance and exit block criteria. 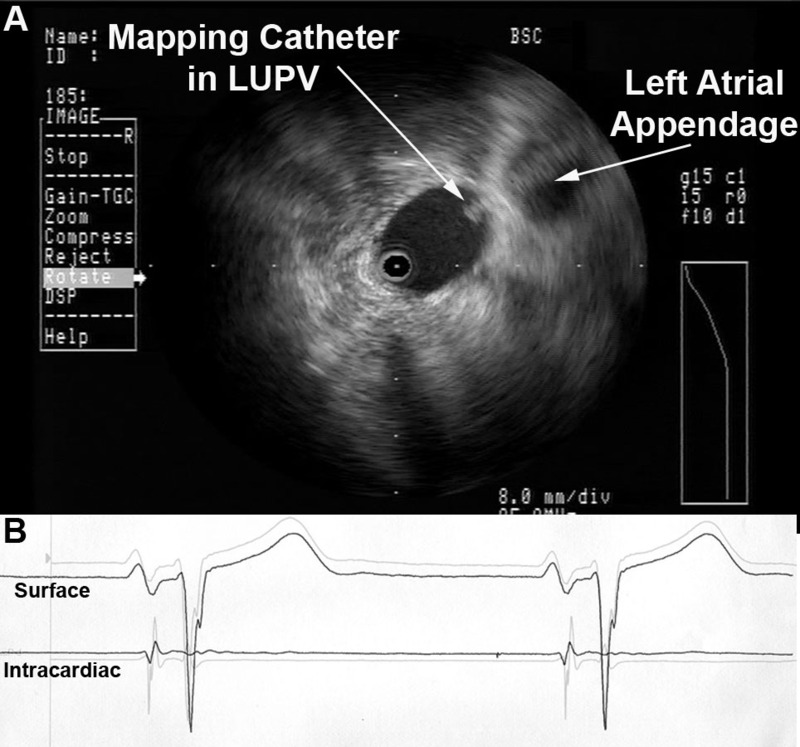 The radial ICE catheter is then placed into the left upper pulmonary vein (LUPV) and entrance block is assessed by examining pulmonary vein (PV) potentials; PV potentials in the LUPV are ablated down to the first branch of the LUPV. Exit block is assessed by unipolar pacing from the ablation catheter; any LUPV capture site is ablated as I pull back toward the primary encircling lesion set. The following video shows the ICE catheter inserted into the LUPV with an esophageal probe at 11AM and the ablation catheter at 5PM. The course of the esophagus is a bit unusual in this case and clearly lower power ablative lesions are carefully delivered (and sometimes deferred) to minimize the risk of esophageal damage. If entrance and exit block are not documented secondary lesions are placed within the primary line to obtain isolation. One can see that radial ICE is used to guide ablation catheter position, maintain catheter stability, and watch for any endocardial damage (such as “heaping”). Once LUPV lesions (if necessary) are completed, the ICE catheter is moved into the LLPV and the PV potential mapping/ablation process is repeated as above. The following video shows the ICE catheter being moved from the LUPV into the LLPV. The following video shows mapping in the LLPV down to the first branch of the LLPV that is evident on ICE. After the left pulmonary antrum is isolated, this procedure is repeated for the right pulmonary antrum. Figure 3 depicts still frames of the pulmonary venous antrums. The following video shows a typical view of the right pulmonary venous antrum. The initial portion shows a real-time view of the right pulmonary venous antrum and then the ICE catheter is advanced into the RUPV; towards the end of the video you can see the ablation catheter enter the RUPV and located at the roof ~12P. Similar to the left pulmonary venous antrum, the right pulmonary vestibule is first encircled by placing a series of focal lesions applied contigously. After deployment of this primary line of encircling lesion, I document that the myocardium subtended by the lesion is electrically isolated using entrance and exit block criteria. The radial ICE catheter is then placed into the right upper pulmonary vein (RUPV) and entrance block is assessed by examining pulmonary vein (PV) potentials; PV potentials in the RUPV are ablated down to the first branch of the RUPV. Exit block is assessed by unipolar pacing from the ablation catheter; any RUPV capture site is ablated as I pull back toward the primary encircling lesion set. Once RUPV lesions (as necessary) are completed, the ICE catheter is moved into the RLPV and the PV potential mapping/ablation process is repeated as above. The following video shows the ICE catheter being moved from the RUPV into the RLPV. Ultimately, a complete right and left pulmonary venous antrum isolation is completed. The final figure below shows a typical final CARTO lesion set with the analogous course of ablative lesions (including ablation within the pulmonary veins) shown on the 3D CT reconstruction. Left and right pulmonary venous antrum isolation can be completed using intra left atrial radial ICE guidance with the complementary use of 3D intracardiac mapping. The radial ICE ensures stable endocardial contact and guides catheter/lesion placement. In addition, real-time radial ICE guidance can enhance safety by highlighting esophageal location as well as provide electroanatomic correlation. Note: Many thanks to my mentor Dr. David Schwartzman who took the time to teach me radial ICE and atrial fibrillation ablations! 1 Schwartzman D, Nosbisch J, Housel D. Echocardiographically guided left atrial ablation: characterization of a new technique. Heart Rhythm, V. 3 (2006), pp. 930–938. 2 Schwartzman D, Williams JL, “On the Electroanatomic Properties of Pulmonary Vein Antral Regions Enclosed by Encircling Ablation Lesions,” Europace , V. 11 (2009), pp. 435–444. 3 Chandhok S, Williams JL, Schwartzman DS, “Anatomical analysis of recurrent conduction after circumferential ablation,” J Intervent Card Electrophysiol, V. 27, No. 1 (January 2010), pp. 41-50. Atrioventricular nodal reentrant tachycardia (AVNRT) is one of the more common arrhythmias ablated in the U.S. There is an estimated 2-6% major and minor complication rate during electrophysiology (EP) studies with ablation. [1-3] The average age of AVNRT patients in a prior analysis of my cases  was 53+/-21 years. These patients are often young with no major comorbidities and the risk of damaging the compact AV node and causing complete heart block is low but always present. Radial intracardiac echo (UltraICE™, Boston Scientific, Natick, MA, USA) can be used to anatomically guide slow pathway modification and ensure stable endocardial-catheter contact. The example below is a patient with AVNRT (and persistent left superior vena cava) that could not be ablated via the traditional fluoroscopy and electrogram (EGM) guided technique despite “good” EGM’s and multiple lesions. The ICE video shown below depicts the initial catheter position encountered when ICE catheter first placed in right atrium using steerable sheath (St. Jude Medical, Agilis). You can see the ablation catheter adjacent to the ICE catheter and overlying the tricuspid valve though not in contact with the anatomic location of the slow AV nodal pathway. We then positioned the ablation catheter at the anatomic location of the the slow AV nodal pathway; near the anterior aspect of the coronary sinus (CS) os at the septal insertion of the tricuspid valve leaflet. You can see the ablation catheter positioned right on this area and single RFA resulted in long run of junctional beats and successful ablation. I use adjunctive ICE-guidance for most AVNRT ablations; though it adds some time and complexity, I feel it maximizes patient safety and successful outcomes. 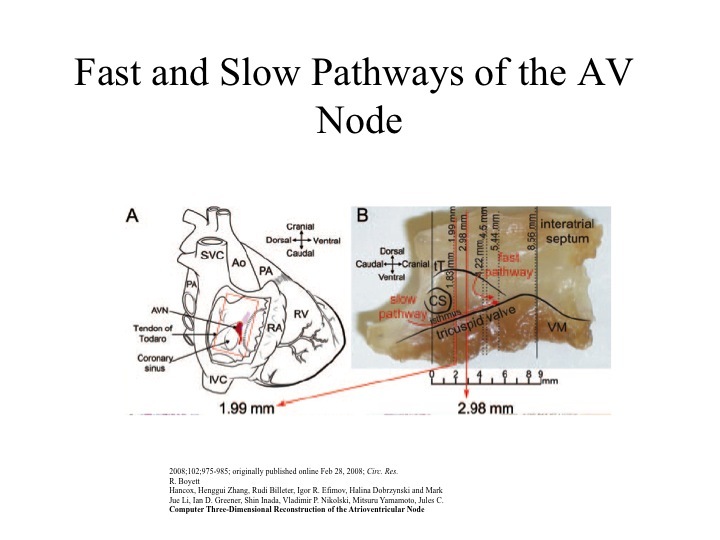 There is a great summary article by Fisher et al  and I have shown one of their figures below to better show the anatomy of the AV node and coronary sinus. 1 Chen S-A, Chiang C-E, Tai C-T, et al. ‘‘Complications of diagnostic electrophysiologic studies and radiofrequency catheter ablation in patients with tachyarrhythmias: An eight-year survey of 3,966 consecutive procedures in a tertiary referral center’’. Am J Cardiol 1996; 77:41–46. 12. 2 ZadoES,CallansDJ,GottliebCD,etal.Efficacyandsafetyof catheter ablation in octogenarians. JACC 2000; 35:458–462. 13. 3 O’Hara GE, Philippon F, Champagne J, et al. Catheter ablation for cardiac arrhythmias: A 14-year experience with 5330 consecutive patients at the Quebec Heart Institute, Laval Hospital. Can J Cardiol 2007; 23(Suppl B):67B–70B. 4 Williams JL, Valencia V, Lugg D, Gray R, Hollis D, Toth JW, Benson R, DeFrancesco-Loukas MA, Stevenson R, Teiken PJ, “High Frequency Jet Ventilation During Ablation of Supraventricular and Ventricular Arrhythmias: Efficacy, Patient Tolerance and Safety,” The Journal of Innovations in Cardiac Rhythm Management, 2 (2011), 1–7. 5 Fisher WG, Pelini MA, Bacon ME, “Adjunctive Intracardiac Echocardiography to Guide Slow Pathway Ablation in Human Atrioventricular Nodal Reentrant Tachycardia,” Circulation, V. 96 (1997), pp. 3021-3029. The following video (courtesy of Dr. Dave Schwartzman, UPMC, Pittsburgh, PA) shows an ex vivo tissue preparation and formation of a steam pop during application of RFA. A significant concern of steam pops is the risk of cardiac perforation. Perforation with tamponade was seen in 1 of 62 (2%) VT ablations where a steam pop occurred. The RFA applications with steam pops had a higher maximum power but did not differ in maximum catheter tip temperature. It reasons that steam pops in the pulmonary veins or atria may pose higher risk of perforation. A middle-aged male with no significant medical history underwent an EP study and ablation for typical atrioventricular node reentrant tachycardia (AVNRT). The AVNRT ablation was being guided by radial intracardiac echocardiography. RFA (using power-control setting) is attempted at the anatomic location of the slow AVN pathway region at the anterior edge of the CS os near the septal insertion of the tricuspid valve leaflet (see Figure). Power was titrated from 5W to 30W but required 40W to demonstrate an accelerated junctional rhythm associated with ablation success. A steam pop was felt and evidence of a small defect in the endocardium in the region was noted on radial ICE as shown in Figure. There was no obvious microbubble formation evident on radial ICE prior to the steam pop. Subsequent echocardiograms demonstrated no evidence of perforation or tamponade and patient was asymptomatic at follow-up several weeks later. Radial ICE showing the anatomic location of the slow AVN pathway and effects of a steam pop after RFA. 1 Nakagawa H et al, “Comparison of In Vivo Tissue Temperature Profile and Lesion Geometry for Radiofrequency Ablation With a Saline-Irrigated Electrode Versus Temperature Control in a Canine Thigh Muscle Preparation,” Circulation (1995), V. 91, pp. 2264-2273. 2 Seiler J et al, “Steam pops during irrigated radiofrequency ablation: feasibility of impedance monitoring for prevention,” Heart Rhythm (Oct 2008), V. 5, No. 10, pp. 1411-1416. Radial ICE can be used to obtain especially informative electroanatomic correlations and has been described extensively during atrial fibrillation ablations. [1,2,3] Aside from guiding the localization of pulmonary vein potentials during intra left atrial ICE guided procedures (shown in Radial ICE for Left Atrial Procedures) there are several instances where radial ICE facilitated electroanatomic correlates can discern situations where ablation is not necessary during atrial fibrillation ablations. The left atrial appendage is often located quite close to the left superior pulmonary vein and left atrial appendage far-field electrograms can be confused with pulmonary vein potentials if this is not suspected based upon electroanatomic correlation. Figure 1A depicts the radial ICE catheter positioned in the left superior pulmonary vein (adjacent to the left atrial appendage) and 1B shows the intracardiac electrograms (EGM) recorded in the left upper PV (darker, smaller amplitude) and LAA (lighter, larger amplitude); The LUPV signal appears to be a low-pass filtered version of the LAA signal. Figure 1 Left Atrial Appendage Electrogram Mimicking Left Upper PV Potential. Image A depicts the radial ICE catheter positioned in the left superior pulmonary vein and B shows the corresponding intracardiac electrogram (EGM) recorded in the left superior PV (darker, smaller amplitude). EGM’s from within the LUPV (darker) and LAA (lighter, larger amplitude) are superimposed. One can also see potentials derived from contiguous myocardium outside the region subtended by catheter ablation of atrial fibrillation. [2,3] These potentials may be located near the LA roof in region of Waterston’s groove, proximal Bachmann’s bundle, and superior caval musculature. For example, distinct EGM’s can be recorded from within the right superior pulmonary vein that may look like, but do not represent, latent PV potentials. Figure 2 Myocardial Potential in the Right Upper Pulmonary Vein that may Represent Bachmann’s Bundle Potential. 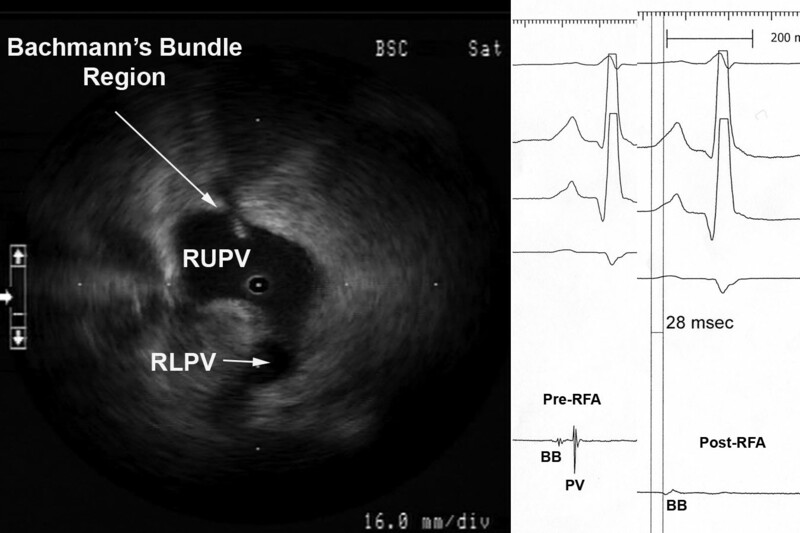 The ICE image shows typical right pulmonary venous antral image with the tip of ICE catheter just within the entrance to the RUPV and the RLPV obliquely viewed. The ablation catheter is located on the roof of the RUPV. A myocardial potential located ~28msec after the onset of the surface P wave is shown before (pre-RFA) and after (post-RFA) ablation of pulmonary vein (PV) potential. We surmise (though cannot prove) that this myocardial potential represents Bachmann’s bundle potential (BB). Figure 2 shows the typical radial ICE view when positioned in the right upper pulmonary vein. There are two distinct EGM’s recorded; the earlier signal ~28 msec after the onset of the surface P wave and the later signal ~70msec after the onset of the surface P wave. The later signal represents a true pulmonary vein (PV) potential that is successfully ablated and the earlier signal remains after the ablation; we surmise (though cannot prove) this represents Bachmann’s bundle potential (BB). This signal can often be seen in the right upper pulmonary vein <30msec after the onset of the surface P wave and its presence does not reflect residual PV potentials. Bachmann’s bundle (also called the interauricular band) has a myoarchitecture that displays parallel alignment of fibers along distinct muscle bundles. Bachmann’s bundle extends from the SVC, crossing the interatrial groove, passing leftward in the left atrium. Intracardiac radial ICE can provide detailed anatomy, guide catheter ablation, enhance procedural safety, and facilitate ablative strategies; it is readily available but generally underutilized. Furthermore, ICE has utility for reducing fluoroscopy times by rendering the operator less dependent upon traditional fluoroscopic monitoring of catheter movement and position. [4,6] Radial intracardiac echo offers 360º views of cardiac anatomy not commonly encountered with traditional phased array catheter or even transthoracic/transesophageal echo though it offers comprehensive utility in guiding EP procedures. 4 Ferguson JD, Helms A, Mangrum JM, Mahapatra S, Mason P, Bilchick K, McDaniel G, Wiggins D, and DiMarco JP, “Catheter ablation of atrial fibrillation without fluoroscopy using intracardiac echocardiography and electroanatomic mapping,” Circ Arrhythm Electrophysiol, V. 2, No. 6 (December 2009), pp. 611-619. 5 HO02 Ho SY, Anderson RH, Sánchez-Quintana D. Atrial structure and fibres: morphologic bases of atrial conduction. Cardiovascular Res. 2002;54:325-336. 6 Khaykin Y, Skanes A, Whaley B, Hill C, Beardsall M, Seabrook C, Wulffhart Z, Oosthuizen, Gula L, Verma A, “Real-time integration of 2D intracardiac echocardiography and 3D electroanatomical mapping to guide ventricular tachycardia ablation,” Heart Rhythm, V. 5, No. 10 (October 2008), pp. 1396-1402.